I got a bit misty-eyed at work today and not because I took my lunch almost an hour and a half late. It wasn’t even because the last two weeks are starting to catch up to me and I’m stupid exhausted. 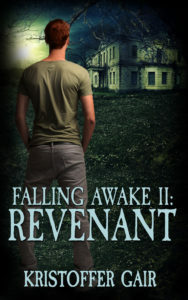 It’s because I saw Falling Awake II: Revenant listed on Amazon. Granted, I got misty-eyed again when I saw it was already for sale instead of pre-order, but my guy is working on that as I type. You have to laugh. With all the drama in our lives right now, is anything bound to be smooth? But this book almost wasn’t. You see, I had this one ready to go a year ago, and then a whole lot of bad things happened. The book got yanked two weeks before it was due to go live. A blog tour was planned and scrapped. A cover was completed and scrapped. You get the idea. This was all my fault, of course. And while it was suggested I might release the book in a decade or so, things improved. Sometimes things also work out the way they’re supposed to. I revisited the book, made some changes that helped align it with the first and third book—which I’m now writing—and moved forward again. Got a new cover, planned a new blog tour, and am ready to unleash this thing. It’s hungry for attention. Each novel I’ve ever completed feels spectacular when it’s finally born. I still see the flaws, but each one is as good as I can make it at the time. Falling Awake was a gigantic step far and away from my comfort zone of writing comedies. One reviewer stated she read it twice thinking she may have missed my usual snark. There was none to be found. There are a few light moments in Falling Awake II: Revenant, only this is also by far not a comedy. I’ll say that I’m very proud of how this book turned out. I proved a few things to myself. First and foremost, I kept a promise I wouldn’t write a second story just because the first one got the best reviews of my career. I’d do it because I felt I had a story worth telling. I also didn’t play it for comedy. I allowed myself to go where the story wanted and needed to. The last couple of years find me searching for hope in this world. And because of this, you’ll see me searching for hope in my writing. This is no easy road, both personally and professionally, and the characters in these stories have it just as difficult. We all hope to persevere. Another thing I’m proud of is Martha Davis, the lead singer and songwriter of The Motels, dug up part of a song lyric that appears before the first chapter. Her words set the mood. Her presence is felt throughout. The second Falling Awake novel is ready. It’ll stand on its own and as the second chapter in a longer story. And it can only end one way. I hope you’ll join me in welcoming it into the world on June 19th. Falling Awake II: Revenant can be pre-ordered here. This entry was posted on Friday, June 8th, 2018 at 6:00 am and is filed under Book Promo. You can follow any responses to this entry through the RSS 2.0 feed. You can leave a response, or trackback from your own site. Hope your endeavor is a smashing success!